Survival mode. This is how Shane and I defined our life during the first year of Lydia’s life. The only goal we really had in life was to fulfill the basic life functions. Eat, have a moderately clean (at least livable) home, and try to survive on basically no sleep. We decided yesterday we have returned to survival mode. Collin (so far) is vastly easier that Lydia was as a baby. However, this time there are two of them. I find it funny how much has changed. Just a few months ago, Shane and I were “negotiating” our free time activities. I would reserve Tuesday night to go out with friends. Shane took Saturday morning for a long run. Now…free time? What’s that? Last night we were negotiating time just to get our “chores” done. Shane wanted to mow the lawn, but I desperately wanted to review bills and take a shower. (A real shower that includes shaving my legs and washing my hair.) We had to take turns eating dinner while the other held a fussy baby. Of course, the person eating was also trying to keep Lydia from dumping her milk on the floor. We are exhausted. Yesterday I literally ran into the wall I was so tired. Shane and I tried to have a real conversation last night, but we both keep falling asleep. It was only 9:45pm. At the same time, this newborn phase is so infinitely better than with Lydia. There isn’t a screaming newborn always in our arms. Collin cries of course, but in comparison to what we are used to, it hardly fazes us. To take the time to write this blog I am using the few minutes when both children’s naps overlap. I have not brushed my teeth and I have not changed out of my pjs. My eyes are still swollen from crying after a sudden onslaught of the "baby blues". I had cold brown rice for lunch with a handful of chocolate chips for dessert. I need a haircut and highlights so badly that I am contemplating taking kitchen shears and lemon juice to my hair. (I will stifle that urge.) My outing for the day was an exciting walk to the mailbox. This is a strange time in life. To be so miserable and tired and yet experiencing such sweetness from my children. To be missing the outside world desperately and at the same time finding that all that is truly precious to me exists in my own home. This morning I was lying next to Collin right after he had drifted off to sleep after nursing. 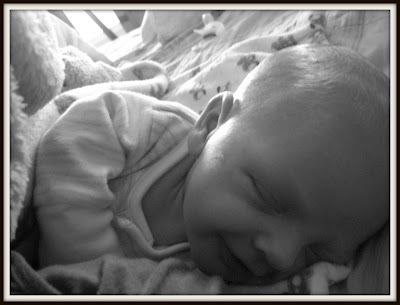 My camera was on my nightstand and I was able to catch him laughing in his sleep. I have to remember that it is these kinds of memories that will last. At least I hope so. Aww he's looks so sweet! What an adorable little face! I so remember those days, and strangely still find myself there almost a year later. The second one really adds another element to family doesn't it? That photo is incredible - and he's a keeper - so sweet!! Those first few weeks/months do seem to stretch on. Hang on - easier days are ahead. I promise. Hang on girl you can do it. I love the photo!! Just a couple more weeks (which will understandably feel like eternity) and help will arrive! My mom will be in heaven caring for the kids and cooking, then I'll swoop in to do the best I can with my own crazy little one in tow :) If nothing more, she and Lydia will surely entertain each other. Hang in there...it gets better and better and better and better...lol I wish I was there to help ya out! I would love to! It does easy up in a while. The first few months are just plain hard. And free time...HA! You have KIDS now so that's kind of a joke. Hope we didn't mess L up too bad by her not naping that day.